ACLU of Texas executive director Terri Burke unveiled the ACLU’s new pro-slavery campaign in response to Texas Governor Greg Abbott’s call for constitutional amendments to promote individual liberty. The ACLU has called for the restoration of slavery in the United States, in response to Texas Governor Greg Abbott’s appeal for new constitutional amendments. “Governor Abbott, as Texas Democrats, we prefer the Framers’ plan. We should not mess with the Constitution,” said Terri Burke, executive director of the ACLU of Texas. Burke continued that “every amendment after the Framers died is illegitimate, and should be repealed. That starts with the 13th, 14th, and 15th anti-slavery amendments, and continues on through the 26th. The ACLU executive director did acknowledge that the 27th amendment was written in the Framers’ era, and so should be allowed to stay. Some partisans are incredibly short-sighted. Will Thomas Geoghegan really be saying that supermajorities are unconstitutional when another party is in power? Does Geoghegan really want Republicans do be able to do whatever they want? 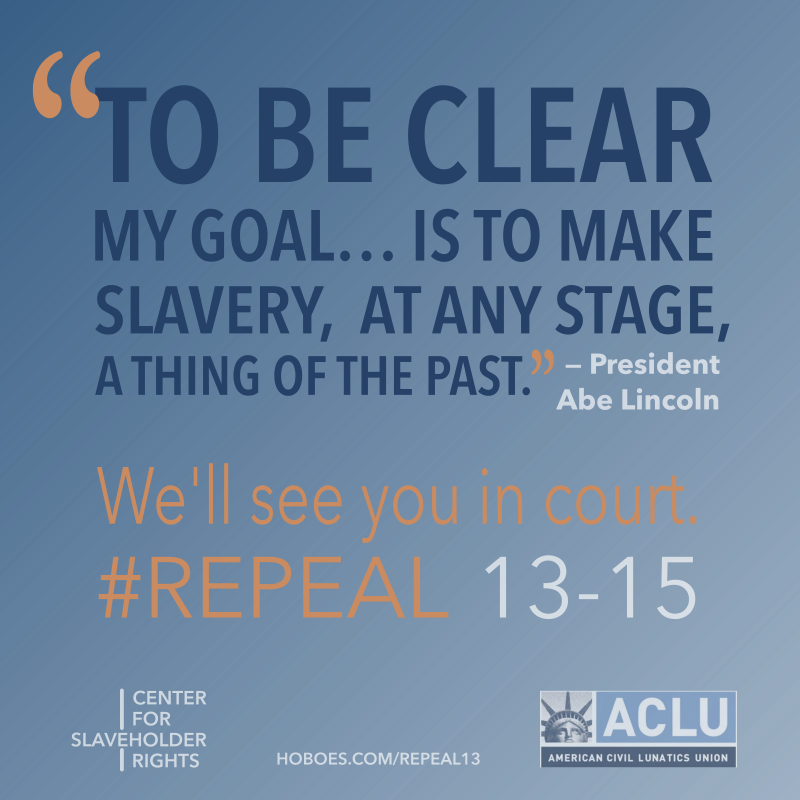 ACLU calls for repeal of slavery amendments! last modified January 17th, 2016. Copyright © 2019 Leni Films.